LEGO fans have been excitedly waiting for the LEGO Castle sets scheduled to be released later this year. LEGO has been taking a break from the Castle line, most probably due to the release of the LEGO Lord of the Rings sets. The last LEGO Castle set released was the #10223 LEGO Castle Kingdoms Joust set released just about a year ago. Now LEGO Castle is coming back! As we discussed already in the Summer & Fall 2013 LEGO Sets – First View post reporting from the London Toy Fair, there will be five sets in the upcoming LEGO Castle line. #70400 LEGO Castle Forest Ambush – two knights pulling a cart loaded with gold being ambushed by two baddies from behind a tree. #70401 LEGO Castle Gold Getaway – red/black carriage being pulled by a black horse, a small chunk of a castle, two knights and a crossbow-cart. #70402 LEGO Castle The Gatehouse Raid – a section of castle wall with a gate, two knights guarding it, a red/black catapult, two baddies, one horse. #70403 LEGO Castle Dragon Mountain – damsel in a small prison on top of a spiral staircase, two knights with catapult, a red/black wizard and a red dragon. #70404 LEGO Castle King’s Castle – large castle with drawbridge, three turrets, 3 or 4 knights plus the King, and three baddies with a siege-machine. At the London Toy Fair taking pictures and videos were not allowed so we only got set names and descriptions. However at the German Toy Fair, happening this week, pictures and videos are fine to be taken, so we should be seeing more an more images and videos uploaded in the next few days. Okay, so let’s look at this image in detail: first of all, as you can see, it has quite a LEGO Classic Castle feel to it. The Lion Knights have the old LEGO Lion-head emblem on their shields, all the knights are (both the good knights and the baddies) wear LEGO Classic Castle helmets and armor pieces. There are new LEGO elements as well, though seamlessly integrated into the LEGO Classic Castle design; the horse is the new kind with the movable back legs. The horse’s barding is using a new mould, allowing the horse to kick back (which the old mould – although fit on the new horse – couldn’t facilitate). The horse’s head armor is also new, as the new horse has a differently shaped head. Also, notice the crossbow the Lion Knight is holding in the tower at the back. It appears to be a new design! Here is the Brickset post that talked a little bit about it. i’m writing an article about them, i just need to finish it then send it to admin. It’s really cool. Check out the Hero factory webisodes trailer on the Microsite. Stormer gets frostier, Surge gets wings and Evo gets a staff. There will be an white-blue colored brain-attacked villain. There will also be this way-cool Rocka with a jet-pack. What interests me most is a massive,blue-colored dragon named “Dragon bolt”. I wish that they would go back to either the 2007 style of more fantasy (dwarfs and trolls, hopefully more), or if they all have to be human, at least give us more factions, like forest men and/or some other third party. 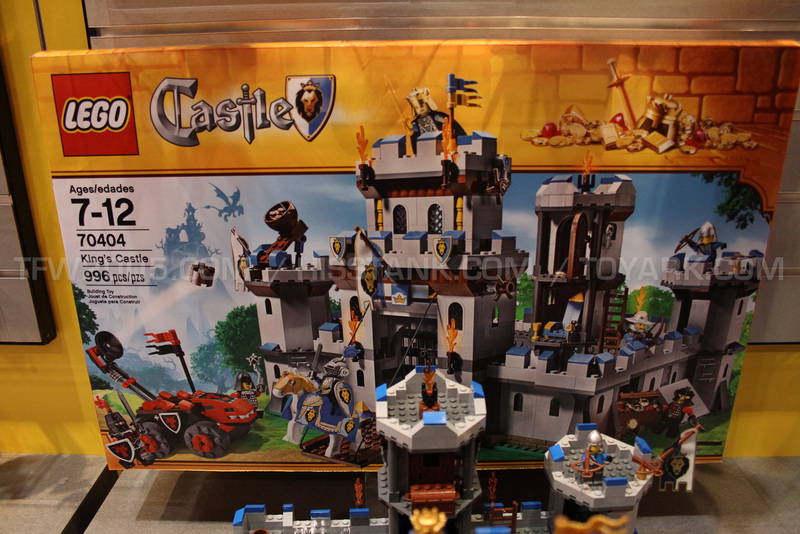 My biggest problem with the last castle line was that, though they made the main castle modular, they did not make any of the other sets modular with it (excluding the joust, which did not hit shelves until the rest of the line was gone from shelves). Unfortunately, this may still be the case here, though I hope to be wrong. I will likely pick up the smaller sets, and there are some things I like (new horse armor, and the new dragon knight torso prints look interesting) but this Castle theme continues to look more and more like a skip theme for me. Jacob, I have read somewhere that parents complained that the Fantasy Era Castle line was “too dark”, and that is why LEGO went back to the more traditional (a.k.a. more boring) castle themes; a goodguys castle, a badguys castle, a carriage ambush, a catapult… nothing to call home about. If you go on the Brickset Flckr account you can see a picture of the Gatehouse Raid, the base wall is a technic 6X1 or 4×1 brick, so I think there might be a chance to expand the castle… pretty cool. Also, there’s a picture of the Dragon Mountain and I gotta say that Dragon looks pretty cool and a bit different than it’s Fantasy Era counterpart. What I don’t seem to like is that the princess or queen seems to have a Friend’s hairpiece… I hope that is not the case… don’t get me wrong, I like friend’s hair on friends minifigs but on LEGO minifigs they make the face look too rounded and not enough forehead, but then again I can replace it with whatever hairpiece I want, but her dress seems really cool, my favorites have to be the knights, adn I also love how you can integrate them with Crown Knights (look at the guards chests), and with the old red and white Royal Knights, and the Kingdom’s Knights, there is A LOT of integration with this line. So even though it may look a bit plain… the possibilities are ENDLESS!!! Notice the technic elements to the right of the 1st pic and check out the dragon on the others. Castle Dragon Mountain sounds awesome! it does! i think i might want that! Throughout Western Europe in the Middle Ages, men hunted wild animals. While game was at times an important source of food, it was rarely the principal source of nutrition. The dog was essential for several purposes. Its good sense of smell made it invaluable in finding the quarry. It would then assist in driving the hunted animal and, when the animal was finally at bay, the dog would either be the instrument of attack, or distract the quarry while the hunter moved in for the kill. Different breeds would be used for different tasks, and for different sorts of game, and while some of these breeds are recognizable to us today, the dogs were nevertheless somewhat different from modern breeds. I think he was wering a scarf. Sorry I meant wearing a scarf. i’m looking forward to this! check out the new stuff, rad! i thought i wouldn’t care for this theme but now what i saw was super cool! i’m going to buy (well i will think about tell the pictures. it just sounds cool with the dragon!) 70403 castle dragon moutian ! I might pick up some smaller sets for the minifigure armor and (hopefully) some greenery and tree elements. Agreed with Admin, the large castle is a bit boring and plain. Better to keep your money for the new LOTR sets later in 2013 😉 Still, I’ll probably pick up some minifigs to diversify my existing armies. I just wish LEGO would get beyond that lion head motif. We’ve had it before with Knights Kingdom I and before that with Royal Knights. It looks like something out of Disney!!! AWESOME! I SO WANT THAT SET! DOES IT COME FOR FREE?! There is going to be a kingdom village set.